Samizdat means having your say about anything you like. You can keep your scribblings to yourself or publish them for the world to read or not, it does not cost anything although in the Soviet Union it could cost you your life. Vladimir Bukovsky summarized Samizdat: "I write it myself, edit it myself, censor it myself, publish it myself, distribute it myself, and spend jail time for it myself." Bukovsky spent much of his time in psychiatric hospitals, that's where dissidents ended up in the old Soviet Union, on the grounds that you would have to be mad to question the actions of the state. To assist the KGB, Soviet psychiatric science invented sluggish schizophrenia that apparently only affected people with ideas about a struggle for truth and justice. 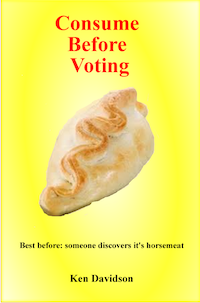 Consume Before Voting - was published on 27/01/19, as both a paperback and eBook. The purpose of this essay is to examine our parliamentary democracy, the ‘first past the post’ voting system, the duplicitous behaviour of our politicians and to take a critical look at the record of our political parties. General Elections provide you with another amazing chance to take part in the national voting lottery. Your choices will be limited to Dead Liberals on the line, Labour, what are we calling the party this week?, Tories@Def-Con1 and Loonies queering the pitch. Leaving aside that voting for any of the above may be a waste of time, given the duplicity of the political class, there are technical reasons why your vote will almost certainly be wasted, due to the nature of the first past the post system. Add in the unequal balance of the voting boundaries and you end up with a decidedly unrepresentative, if not undemocratic process. The party machines will be sending out polling spiders to crawl across the land, so that they can tailor their convictions to match voter sentiments, well, at least until the ballot papers drop in the box. And opinion spouters like Yasmin Alibhai Brown and Jeremy Paxman will tell you not to listen to hippies, who say they will not vote and do not think anyone should. According to Yasmin, not voting is “irresponsible”. Yasmin, however, does believe that our democracy is in crisis. Quite how engaging in a voting charade, that only promises more of the same, fixes the crisis is a bit of a puzzle. 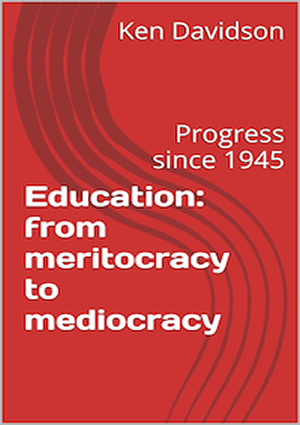 Education: from Meritocracy to Mediocracy was published in October 2016, paperback and digital versions are available from Amazon. Every year since the 1944 Education Act has brought changes to the education system. The whole piece a never ending experiment, with children as the subjects. Every new initiative part of a grand design to transform education. The public would be assured that standards would be raised and the attainment gap between the ‘haves and have nots’ reduced. The public at large may be unaware of the disruption that all these changes wrought on schools. The introduction of the National Curriculum in 1988 may have created hair loss among teachers but it turned a generation of children into guinea pigs, taking part in an ill-designed experiment. That is, the emphasis on testing was misplaced, the Programmes of Study were over-prescriptive and the attainment targets were opaque. And to England’s shame, the pupils and teachers taking part in the early years of that experiment never did receive so much as a Duke of Edinburgh’s Award for their sacrifice. After 70 years of free universal education, politicians and social commentators are telling us that we have a mediocre education system in England, (based on unreliable international tests) which is damaging to the nation’s international competitiveness and failing to produce well rounded contributing citizens. How did this nightmare come to pass? Surely, all the billions spent and all the wisdom applied to the problems of education should add up to more than mediocre? It might just be the case that mediocre is as good as it gets, when the policy makers, the academics and business men they listen to do not actually know what they are doing. The situation is made worse within a culture that demonises teachers who go off piste, rejecting facts in favour of seeking better ways of reaching out to disaffected children, a culture that treats teachers like machine minders, spending their days ticking boxes in anticipation of the next Ofsted visit, the next performance management review and getting to grips with the latest revisions to the National Curriculum, the obesity crisis, the terrorist threat and so on. 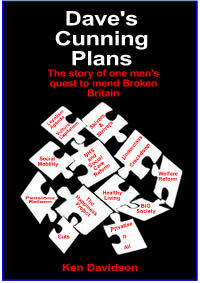 Dave's Cunning Plans was published in 2014. It's available as a paperback from Amazon, £6.42 or download the digital version for £3.82. 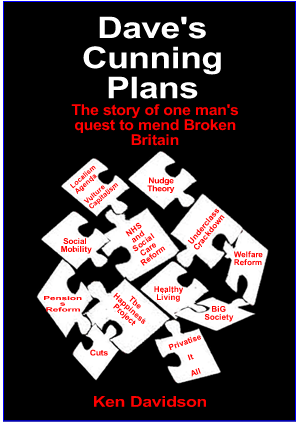 Dave's Cunning Plans tells the tale of the 2010 Coalition Government, that nobody voted for, and its plans to reshape the landscape, to bring a new vision to this benighted land..... it's was worse than Dave imagined. When Baldrick announced to Black Adder, "I have a cunning plan", we knew that we would be treated in equal measure to an imaginative wheeze, coated with a thick layer of lunacy. Prime Minister, Mr Cameron, henceforward, known simply as Dave, was no Baldrick but he did employ a large number of Baldricks. He actually kept them under the stairs at No.10 Downing Street and consulted them on a daily basis for his supply of cunning plans. 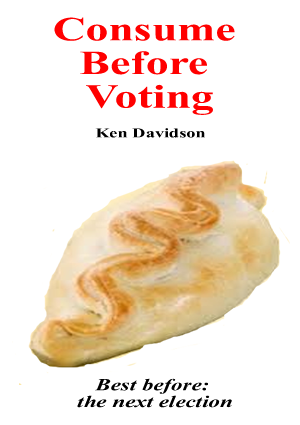 As you proceed through the book you'll discover that much of what Dave was doing was just a continuation of New Labour's 'third way', i.e., a rag bag of borrowings from the wilting Empire of America, focused on dealing with the workshy. In truth Dave could be a bit reactive, not one of life's great thinkers, it's was not easy being Dave but he did try to keep busy, continuing with the behaviour correction programmes of New Labour; privatising the space between your ears and the pores that allow your skin to breathe, all the bits that Mrs Thatcher didn't manage to get to. When it comes to other matters, such as imperatives driven by global events, whether saving the planet from global warming, the Euro pantomime or Nato's 'humanitarian' interventions, Dave was just another cartoon character being boxed about the ears by some comedic sketch writer. Dave was dealing with the deficit; largely by cutting the public sector and transferring its functions to private contractors, charities and communal good will. Dave was cutting to the bone because we simply could not afford the future! Dave was driving out social decay; the detritus of welfare scrounging, benefit cheating, anti-social feckless festering underclass scum, and limbless incapacity claimants - he contracted the best in the private sector for the clean up, although sometimes, they let him down. In truth, Dave was let down a lot, mainly by his colleagues; Liam Fox, Oliver Letwin, Chris Huhne, Andrew Mitchell, Jeremy Hunt, David Laws, Theresa May, Maria Miller, Francis Maude, Peter Cruddas, Andy Culson, Brooks Newmark, Douglas Carswell, Mark Reckless and Patrick Mercer have all let the leader down.